Richfield Interiors Design and install beautiful Bespoke Bedrooms throughout the Midlands. A bedroom needs to be a calming place to relax and enjoy, and we know how important it is when looking for a new bedroom that everything runs smoothly from start to finish. 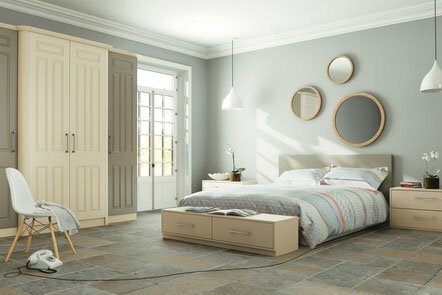 At Richfield Interiors, we provide the complete turn-key service from start to finish, making sure your new bespoke Bedroom looks stunning, is installed with as little disruption to you and is completed quickly without compromising on our high standards. Our aim is to produce a design that's in harmony with its surroundings, ensuring it is both functional and beautiful to look at. At Richfield's we offer our customers a complete service. We design, manufacture, and install, all our Bespoke Bedrooms with attention paid to the smallest detail. We manufacture our bespoke bedrooms from our own on site factory located in the Midlands. Our skilled craftsmen use a combination of traditional working methods and modern technology, creating stunning furniture that is built to stand the test of time. At Richfield's we give careful consideration to the details of each design we produce. We have a wide range of storage solutions available, specialized pull-out systems and inserts. These can be fitted to cabinets and drawers, utilising all the space available, while keeping everything fully. We take great care in the construction of all our finished products, ensuring each cabinet or specialist component is produced to the highest of standards. To see some of our previous installations see our Gallery and Portfolio to help give you an idea of just some of the beautiful Bespoke Bedroom Fittings we have undertake in the past. We only use our own team of experienced, professional installers who have vast experience in bespoke bedroom fitting and bespoke kitchen fitting, and never outsource our work. Our professional team of installers are able to meet all fitting requirements with the appropriate qualifications and experience with electrics, plumbing, tiling, carpentry and plastering, meaning we can handle the entire process from start to finish. 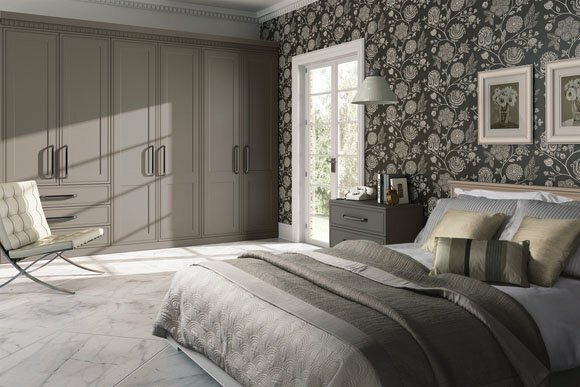 Contact Us today to start planning your Bespoke Bedroom Fitting. We make use of extensive design and planning, and use only the highest quality of Kitchen Craftsmanship to design and create your dream Bespoke Bedroom and only use our highly qualified installation team to ensure the finest possible finish.